The Noctule bat has a wingspan of 320 - 450 mm and a distinctive reddish-brown oily fur. Its ears, nose and membrane sport a a dark-brown colour and its wings are rather long and narrow. This species occurs mostly in hardwood forests though it can now often be spotted in urban areas if enough prey and water is available. For summer roosts N. noctula favours treeholes (e.g. woodpecker) along the forest edges. In winter, rock crevices in buildings and bridges are often used. N. noctula has a very fast and direct flight, often above the tree canopy. With deep dives and its loud echolocation, the Noctule bat is able to quickly catch its prey: moths, chockchafers, crickets and dung beetles. This is a typical migratory bat species. Populations from northeastern Europe are known to migrate southwest in autumn, thus covering distances of up to 1 000 km. Due to the weather conditions, western populations tend to be more sedentary. 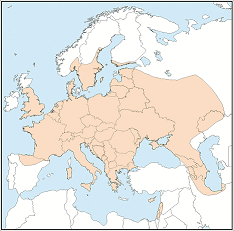 The Noctule bat can be found across Europe all the way to the Urals and Caucasus region. Also occurs in Asia Minor.